This website is for app support as well as math and actuarial items I find interesting. The Apps pages provide a summary of, and links to, some apps I have written for Apple iPhone/iPad and Android devices. The Math pages are pretty limited, but show some mathematics I find interesting. I added a page discussing a variety of poker played at the local recreation center and the frequencies of various high and low poker hands. I had not seen this poker variation discussed anywhere else. The Actuarial pages have some brief information on population and longevity trends in the US. I added a page with a link to chart I made of US Treasury rates. The direct link is here. Unfortunately I haven't figured out yet how to make the chart look good on mobile devices, but on a computer you can hover over any of the curves with your mouse and read off point values. You can also select a range of dates to display. A short geometry problem below. 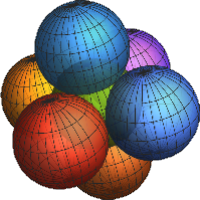 Six unit spheres Intersect a seventh equally with centers √2 from the center of the middle sphere. What is the volume of the intersection? For the answer see the Math page.